This blog post is sponsored by iHerb. All opinions are my own. We all know that beauty starts from within, but what we put on our bodies is just as important as what we put in our bodies. I once had a dermatologist tell me that I’d “be shocked” if I knew what was really in the bath products I use every day. She followed up by saying that roughly 80% of our bath and beauty products are never tested, and companies aren’t required to list all the ingredients on the label (they just chalk it up to “trade secrets” and hope we don’t notice). When it boils down to it, the personal beauty industry is effectively unregulated. And it isn’t just our makeup that’s a lawless land. The bath and body products we use on our skin and hair are unregulated as well. And since a lot of the ingredients are hidden (ahem, “trade secrets”) most of us are being exposed to more toxins and chemicals than we’re ever aware of. But while we all know what chemical exposure is bad, it’s easy to overlook just how bad they are—until something goes wrong. It all boils down to the endocrine system. The endocrine system, a collection of glands that regulate everything from our mood to our reproductive health, is especially sensitive when it comes to toxins. A lot of the chemicals in our bath products are classified as “endocrine disruptors”, meaning that, even in small doses, they mimic the hormones our bodies produce and disrupt our bodily processes. This can lead to metabolic problems, reproductive issues, cancer and other scary disorders. That’s why it’s important to read labels carefully, do your research and choose a brand that you trust. iHerb has long been a global leader in natural wellness and healthcare. 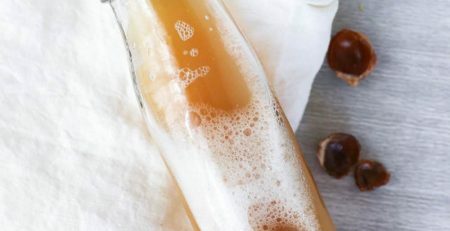 With an online store of over 30,000 brand name natural products, they pride themselves on bringing the best overall value in natural products to customers all over the world. And they recently expanded into their own line of natural bath and body products called Mild by Nature. 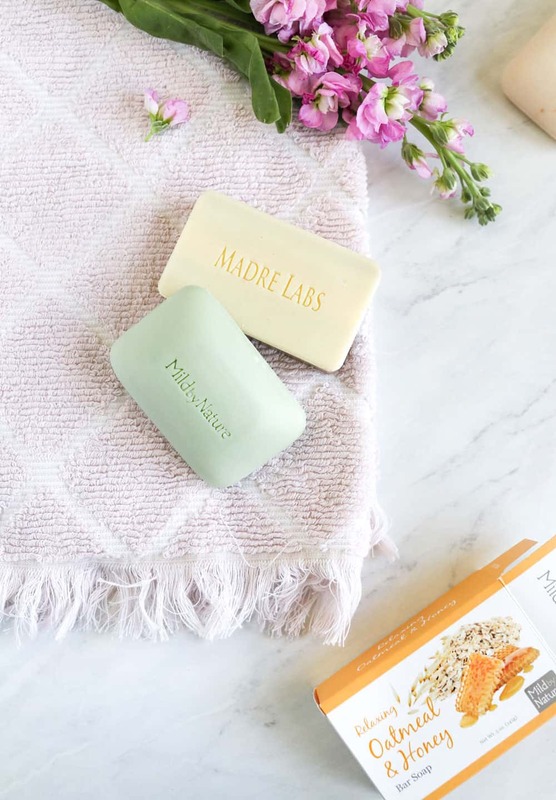 Mild by Nature focuses on gentle and nourishing everyday bath products formulated without any of the toxins you might find in similar products. That means no GMOs, parabens, sulfates and the like. But it’s not just the natural products I love, iHerb also offers a no excuses delivery guarantee on every order. They provide free or discounted shipping to over 150 countries around the world and if for whatever reason you don’t receive your order, they’ll take care of it, no questions asked. 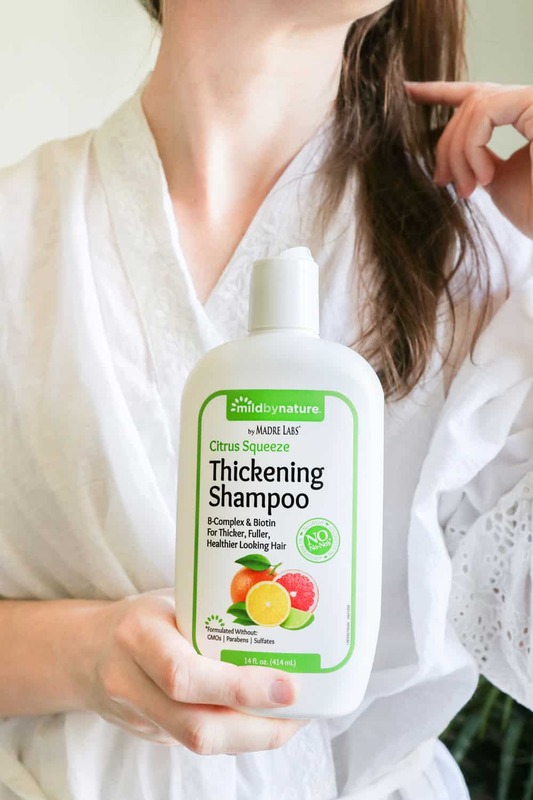 Plus, as a California-based superstore, iHerb guarantees that all products are authentic brands sold in the U.S. market, they provide quality assurance for all of their products and they ship directly from climate-controlled warehouses. I’m picky about my mouthwash. For better or worse, I’m prone to get a little carried away with those super strong, alcohol-based mouthwashes that burn when you use them. So truthfully, this mouthwash took me by surprise. It’s not strong or overpowering and the minty flavor is super subtle, but after a couple of days I was obsessed. It comes in two flavors: Sweet Mint and Fresh Mint. Both are flavored with essential oils and botanical extracts, and are free of alcohol, fluoride and sulfates. And both taste really good. Even my husband (another picky mouthwash-er) fell in love with them too. You’re either a bar soap fan or a bodywash fan. Personally, I’m a bar soap fan. I think it’s luxurious and more nourishing than body wash, plus since it’s creamy, it locks in moisture better than liquidy body washes. Mild By Nature soaps are made with goat milk (amazing for sensitive skin) and chock full of nourishing botanicals. The 6-pack is like a sampler of great-smelling soaps, but my favorite scents are the Oatmeal and Honey or the Turmeric and Teff. It also comes in Cucumber and Kale, White Tea and Lime, Maine Blueberry, and Shea Butter and Sweet Almond. I like to pop a bar in one of those scrubby soap pouches to buff away dry skin and improve circulation. Then I just hang it up to dry in my shower until next time. I have fine hair so I was especially excited to try a non-toxic thickening shampoo and conditioner. 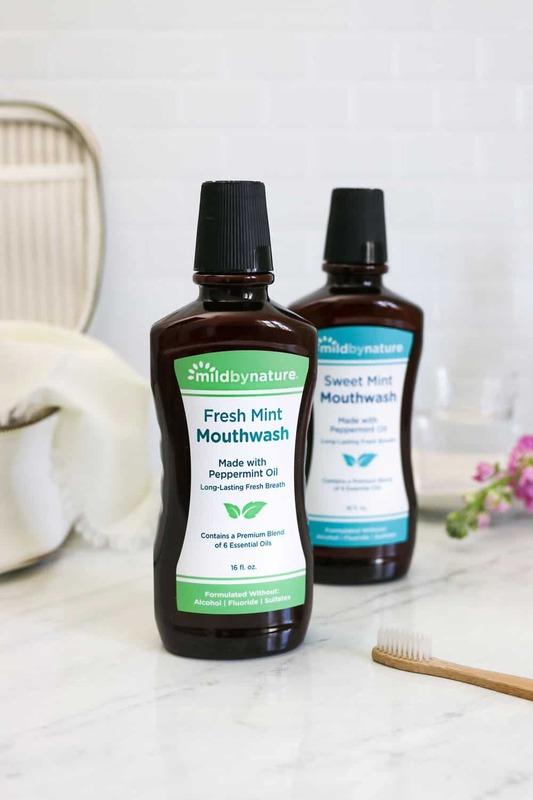 Like Mild by Nature’s other products, it’s free of the biggest no-nos like GMOs, sulfates and parabens. And it’s loaded with Biotin, Panthenol, Quinoa and Flax Proteins for thicker, fuller looking hair. You can get it in Rosemary Mint (my favorite) or Citrus Squeeze. I only use shampoo every other day, but I like that it makes my hair feel squeaky clean (a must if your hair falls flat right after washing). And I noticed that on days where I curl my hair, it holds its style for a lot a longer. As someone with perpetually dry hands, I live for hand cream. I carry this Mild By Nature Argan Hand Cream in my handbag so my hands don’t turn into a chapped, flaky mess in the winter. It’s loaded with nourishing oils like Avocado, Coconut, Jojoba, Sesame & Olive, and it sinks in quickly and lasts for hours. 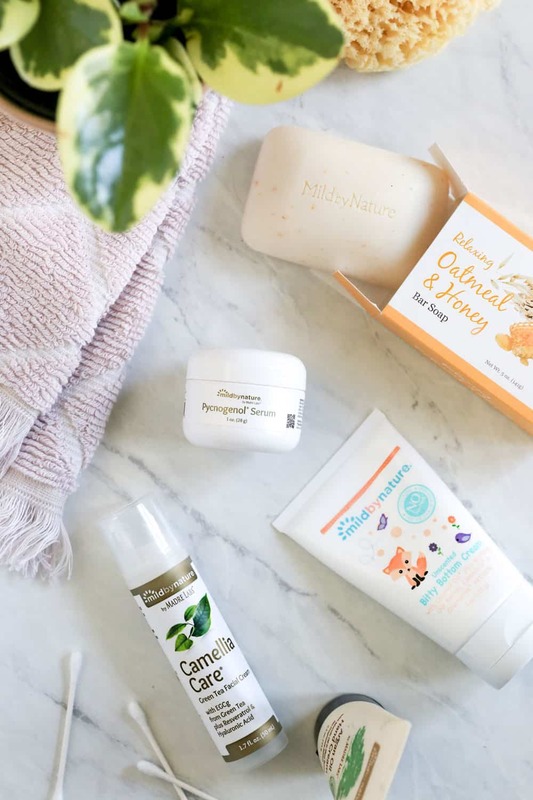 Anti-aging products are the worst when it comes to toxic ingredients, so when I find a good natural beauty product, I stock up. Pycnogenol serum is derived from pine bark, and research has shown that it helps smooth out skin irregularities and improve texture and elasticity. 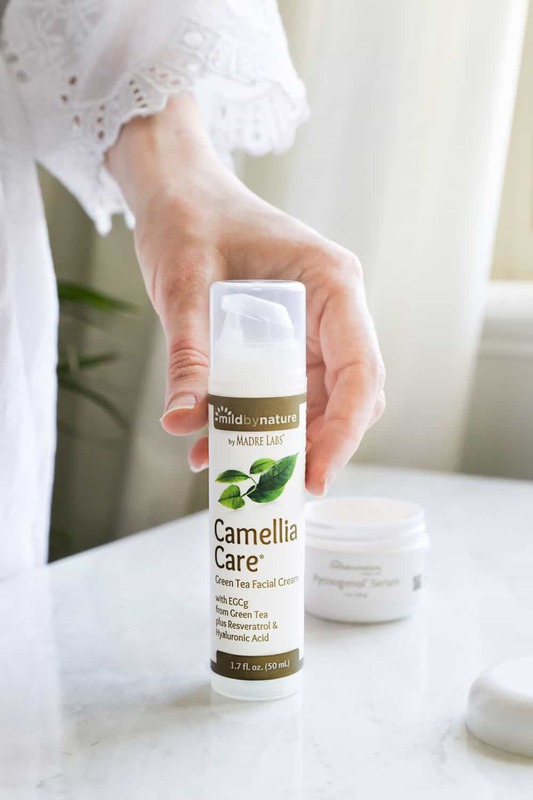 And the Camellia Face Cream is loaded with concentrated EGCG from green tea, as well as Resveratrol and Hyaluronic Acid. It’s said to help maintain skin hydration and firmness, and improve skin tone. I apply both before bed and sometimes in the morning if I’m looking especially tired. Having used them both for over a week now, I haven’t seen any crazy improvements in my fine lines or wrinkles. But I have noticed that my skin feels supple longer, especially when I wear them under a moisturizing facial oil. While I don’t have kids yet, I’m not ashamed to use Mild By Nature’s Baby Shampoo & Body Wash myself. It’s formulated especially for sensitive skin so it’s pH balanced and free of any nasty chemicals. And it contains Aloe Vera, Evening Primrose, Borage and Flax Seed to soothe a variety of skin types. I found that it lathers nicely and has a soft, clean scent. You can choose between coconut cream and peach (the peach is tear-free), both of which smell really good for not having any weird ingredients. The diaper cream is extra thick and creamy, so a little goes a long way. One of the reviewers online says she uses it for her eczema (genius!). So just to test it out, I applied some to the back of my hands one night before bed and when I woke up the flakes and irritation were almost completely gone. Are your ready to overhaul your bath and body routine?